Neo/Poly/Dex Ophthalmic Ointment is used by veterinarians for the treatment of bacterial infection in dog's and cat's eyelids and eyes. It is also effective in healing other feline and canine maladies, especially infections that might arise from ulcers, scratches and allergies. Neo/Poly/Dex Ophthalmic Ointment is a uniquely formulated treatment to provide soothing relief to your pet when administered with the specially designed sensitive applicator. Neo/Poly/Dex should not be used in cats or dogs allergic to any of its individual ingredients. In addition to ophthalmic conditions, this product can be used to treat pet ulcers and infections that might arise from scratches and allergies. 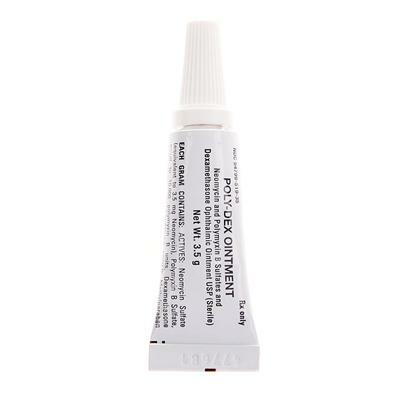 Neo/Poly/Dex Ophthalmic Ointment is an essential addition to any dog or cat lover's medicine cabinet. Side effects when using Neo Poly Dex are not common; however, when the drops are applied there may be some transient stinging. When the ointment is used, there may be some transient blurring of vision. Neo Poly Dex should not be used in animals allergic to any of its individual ingredients. The medication should not be used in cats with possible herpes virus infection. Contact the veterinarian if the condition does not show signs of improving within 48 hours, or, if the condition worsens. Do not touch the applicator tip of the bottle or tube to the eye or skin to prevent contamination of the medication. Neomycin, Polymyxin B, and Dexamethasone.